HONOLULU (KHON2) – KHON2 News has confirmed a scabies outbreak at the Kona Community Hospital on the Big Island. A spokesman for the hospital said the outbreak had been confirmed on Monday, November 19. The hospital says it's working with the state's health department in Hawaii. "We have implemented procedures and protocols consistent with our policies for any infectious outbreak and since then, our Acting Chief Nursing Officer and our Director of Infection Control have been coordinating the management of the outbreak." According to the Centers for Disease Control, scabies is an infestation of the skin caused by the itchy mite. 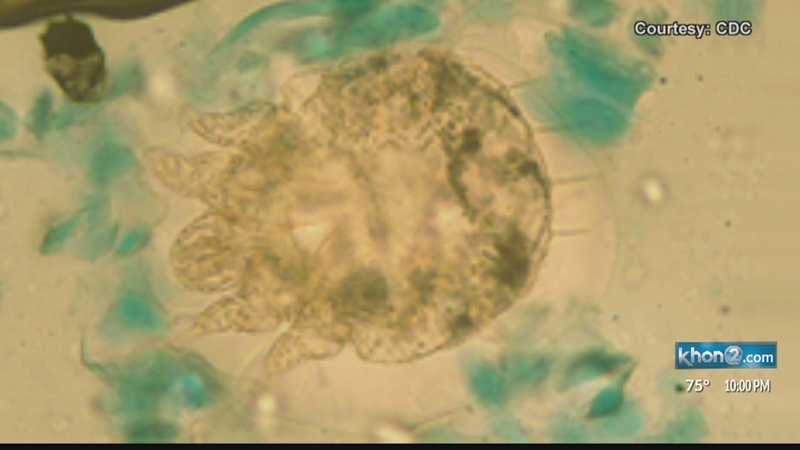 Microscopic scabies penetrates into the upper layer of the skin where it lives and lays its eggs. The most common symptoms of scabies are intense itching and a rash similar to a pimple. Scabies is usually spread by direct, prolonged skin-to-skin contact with someone with scabies. If you have never had scabies, the symptoms could take four to six weeks to appear. "Probably in a hospital, it is brought in by a patient and is passed on to a health care provider and because it is extremely contagious." Health care providers can pass it on to other providers of health care and even potentially to other patients.Take the best precautions with hand washing and gloves, it is transmissible, "said Dr. James Ireland of the John A. Burns School of Medicine.